This past week Swoope bore the brunt of the Snowquester, a.k.a. winter storm Saturn. It gave us almost two feet of snow – unwelcome weather for cattle farmers during calving season. A calf born in this weather can perish quickly. We were lucky. The storm left no casualties among our herds of cattle. Snow still covers the land. Late yesterday afternoon we rode in the four-wheel drive hydra-bed truck with a 1,000-pound round bale of hay on it, through the snow, to give each herd plenty of hay. We also checked the cows for signs of labor and tag any new babies. 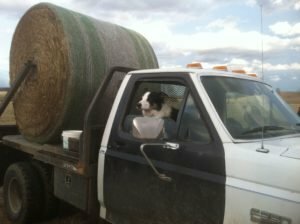 The four-wheel drive, hydrabed feeding machine with our herd dog Dexter. As we checked the cows we noticed cow tracks in the snow from lone cows leading to places along the fence or near a thicket of honey suckle. These were cows looking for their “special spot” to have their babies: away from the other cows and somehow protected from weather or predators. They select their spot then go back to the herd until the process of labor begins. Cow #75 was in her “spot” so Jeanne unrolled a dab of hay for her. After her baby is born and gets his first meal she will tuck him into the dry hay to keep him warm. It was sundown and we were now finished with all the farm chores. We headed home to stoke the fire in the wood stove and relax a bit with a glass of wine. 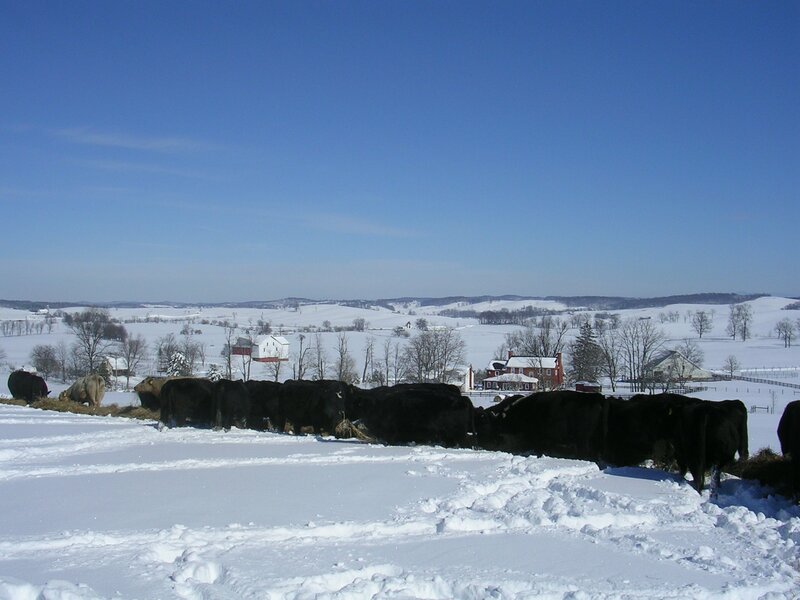 The back-field herd of pregnant cows eating hay in Swoope. One of our calving herds is behind the house to the west. Jeanne was looking out a window with binoculars checking the cows for signs of labor and sure enough there was a cow on the horizon with her “water bag” out – the first real sign of active labor. We both watched the whole birth from the French door windows in the kitchen. The cow laid down for a while then stood up. Next the front feet of the calf emerged; she laid down again, then stood up. A huge push and the head emerged. Now she was standing up with the baby halfway out dangling from her womb. Birth’s vapor rose from the baby still enveloped in the placenta. She spun around and pushed several more times and minutes later the baby plopped onto the now freezing, snow covered ground. The cow immediately began licking that baby with her huge warm tongue. In less than a minute the calf’s head was up. It was the perfect bovine birth. It wasn’t quite dark so we decided to check the other cows one more time from the road. Cow #75 was still in her “special spot” most likely in labor. As we drove home on Cattleman Road just past dusk we stopped to watch the Short Eared Owls hunt. I thought how difficult it would be for them in this snow to find a mouse or a Meadow Vole. The voles especially like snow because it creates an opaque shield from the many raptors that prey upon them – especially owls. 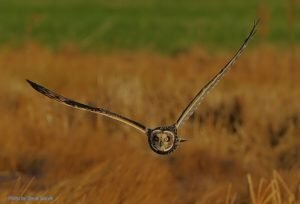 A Short Eared Owl hunting over grassland. CLICK on this photo to see a VIDEO of Short Eared Owls hunting in Swoope. The video was taken by neighbor farmer Michael Godfrey. Photo above by Steve Garvie. We were lucky. Two owls emerged from mystery and hunted stealthily over the snow-covered grasslands of Swoope. We watched them with our binoculars until our arms ached. They flap their wings silently then glide over the snow covered runways the voles make in these vast grasslands. These owls dive feet first for prey and one of them caught something under the snow. Its wings were splayed out horizontal on top of the snow. It’s head went under the snow, took a bite of its prey then popped its head up and spun it around in one direction almost 180 degrees then spun it the other way. We didn’t leave until it was too dark to see. The vast grasslands of Swoope are home to many special creatures. Birders from all over Virginia come here to see the Short Eared Owls. The owls are here because of the Meadow Voles and the voles are here because of the grass. Cows are another special creature and during the next few months there will be many cows searching for a “special spot” to have their babies. Nice to see all that snow on the mountains Bobby! I like your round bale set up on the pickup. It sure beats forking it all by hand like I do every night but I need the exercise though after sitting behind a computer screen all day managing contracts. I have not been outside much at work since leaving Virginia in 2005. Jim, thanks for stopping by. The hydra-bed is awesome. It’s much faster than a tractor albeit we did have to use the tractor during the snow quester. I’ll bet you have a lot of contracts.